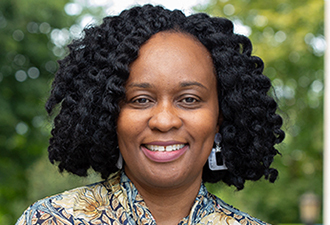 Femi Cadmus is the Archibald C. and Frances Fulk Rufty Research Professor of Law, Associate Dean of Information Services and Technology, and Director of the Michael J. Goodson Library. Her almost three decades professional career in law libraries spans both academic and law firm libraries where she has taught legal research and analysis, and law practice technology to law students and attorneys. Cadmus comes to Duke Law from Cornell University where she was Edward Cornell Law Librarian, Associate Dean for Library Services and Professor of the Practice from 2011-2018. Her previous professional experience also includes positions at the Law Schools at Yale, George Mason University and the University of Oklahoma. Cadmus is active in regional and national library associations including the American Association of Law Libraries in which she is currently president. She also serves on the advisory boards of LawArXiv, The Global Online Access to Legal Information (GOALI) and LLMC Digital. Her research focus, publications and presentations cover topics such as law and technology, the evolving role of the modern day law library, open access to legal information, and law library management and administration. Cadmus’ educational background includes an LL.B. from the University of Jos, Nigeria, B.L Nigerian Law School, LL.M. (Law in Development), University of Warwick, England, and M.L.I.S. from the University of Oklahoma. She is admitted to practice in New York.